A couple of days ago, we came across a listing for Flashback 25th Anniversary on Amazon Germany. It was the first time we had heard about the Switch release since Microids’ announcement last year. Microids has now officially confirmed that Flashback 25th Anniversary is heading to Switch in June. A collector’s edition will be sold in Europe and Australia (folks in the US can import from Amazon Germany here), which certainly makes the €39.99 price tag from Amazon Germany more justifiable. 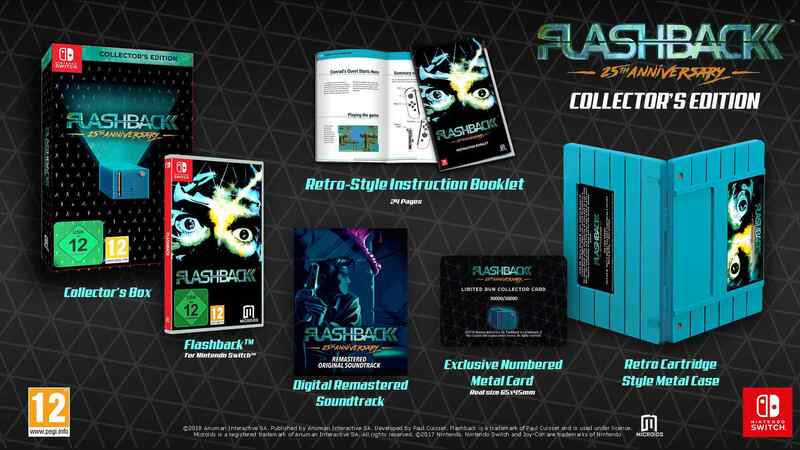 Included inside is a physical copy of Flashback 25th Anniversary, a retro cartridge style metal case, an exclusive numbered metal card, a 24-page retro-style instruction booklet, and the digital soundtrack (remastered version). Flashback on Switch will let players choose between the original 1993 gaming experience and “Modern” mode. The new mode has post-FX graphic filters, completely remastered sound and music, a brand new “Rewind” function that’s variable according to the level of difficulty, and tutorials for those who need a boost. Flashback 25th Anniversary will be out for Switch on June 7. We have a brief teaser below.